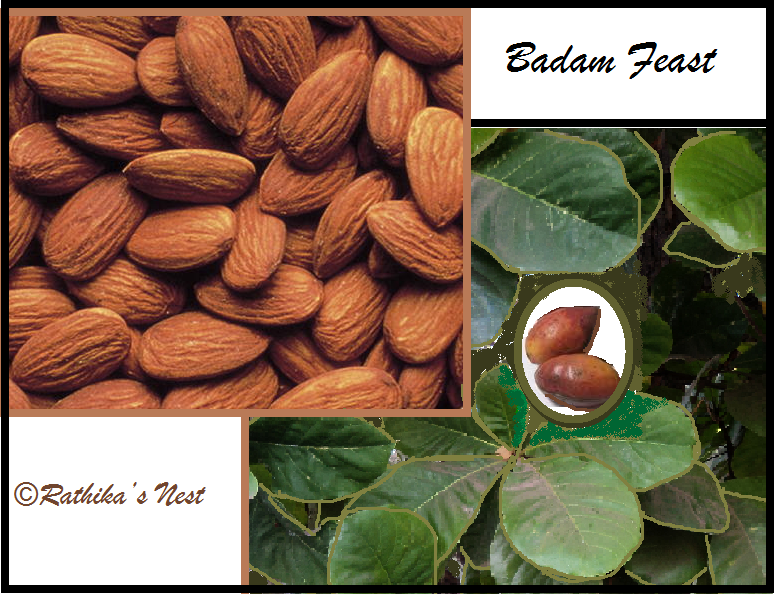 During my recent visit to the supermarket, I found a pack labelled "Badam Feast" - an instant badam mix, famous product of a leading food manufacturer in India. Trying to choose between real almonds and the instant mix, my mind wandered to a different kind of "Badam Feast" I enjoyed as a child. When I was in the fourth grade, we moved into the small town on the foothills of the Western Ghats. Initially, we stayed in a rented house, before my father built our own home couple of years later. The rented dwelling was a traditional row type house with a backyard extending up to the river. As I set out to explore the house with my brother, we stumbled on red colored fruits scattered over the backyard. While we were examining those hard rough fruits, a voice announced from above "These are badam (almond) fruits (வாதாம் கொட்டை)..."
A boy, aged 10 years or thereabouts, sitting on the high compound wall was speaking to us. He smiled broadly exposing his rather protuberant front teeth and said, "I am Viswanathan... Call me Vichu... I live next door..."
Vichu and his sister soon became our friends. They knew a lot about the trees and plants in our backyard. And so, it became an obsession to explore the backyard, which was good one furlong in length. As we came out of the back door, there was a platform of sorts with few stone steps leading to a foot path. On either side of the foot path there were trees and bushes grown wildly. Foot path led to another set of stone steps leading down to the river. These steps were called 'padithurai' (படித்துறை). Each of those row houses on our side of the street had similar 'padithurai'. River was rather wide, with the current becoming turbulent during rainy season. There were mango and coconut groves on the opposite bank of the river. In addition to the wild vegetation, there were several birds, occasional cats and quite a few insects in our backyard. Of all these, we were deeply fascinated by the badam tree, whose branches were spread over the shed at the backyard. Monkeys visited often to feast on the badam fruits. 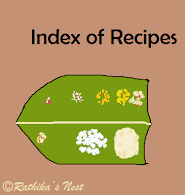 We would pick up the leftover fruits on the ground and try to extract the badam nut (வாதாம் பருப்பு). After considerable effort we may end up with one or two nuts! One day, we decided to collect as many badam fruits as possible before the monkeys arrived. Vichu was good at scaling the walls and climbing the trees. Hence, it was agreed that he would climb the compound wall, reach up to the branches and throw the fruits down, while others would collect the fruits. In the process we managed to collect quite a few badam fruits. Each of us found a stone and started to break the hard fruit on the stone steps at the backyard. After almost an hour, we have extracted some nuts and still a few fruits left needing our attention. As luck would have it, a troupe of monkeys arrived at this juncture. We hurriedly collected as many badam nuts as possible and retreated to the safety of the house. After a brief argument on splitting the spoils, an agreement was reached. A short while later, each of us had five or six badam nuts in our dirty and sweaty hands. The nuts were rather badly crushed and dirty due to our crude process of extraction! We sat together and happily ate those fresh nuts. That was the best badam feast I ever had, literally the fruits of our labor.